It was supposed to be round three of the V.E.S. League today but loads of rain on Friday had me fearing the worst, Saturday lunchtime the river was still really high and with more rain forecast the decision was made to move it to the pond. It’s always a difficult call as the river does fall really quickly and there was chance it could have been perfect on the morning but we have to make a decision. You’re damned if you do and damned if you don’t, last year I put it on the river a couple of times when it was the wrong choice, the second time, the river went from being perfect to unfishable in three hours. As we moved it to the pond, it wouldn’t count in the league and we’d use one of the reserve dates later in the year. I got to the bowling club and there were the usual predictable comments about the river being perfect which it probably was but organising matches is a right ball ache of a job and a thankless task, there’s always opportunity to get involved if people would like to help but unsurprisingly most want to just turn up and fish. It’s a worrying trend but at the current rate we’re getting through three match secretaries every two years! Anyway, back to the fishing, I announced the draw and as always, I fancied pegs 13 and 14 but by the time Jake pulled the last ball out for me, they’d both long gone. 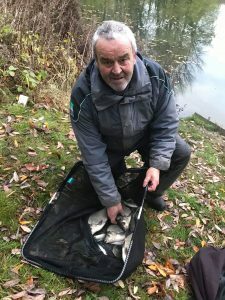 I ended up with peg 6 which is a decent area, we got out the pond and it was really clear and several people, me included, thought it might fish hard, Fieldy reckoned 5lb would be a good weight whereas I thought 10lb would be enough. On arriving at my peg and I could see quite a bit of submerged weed in front of me and I knew it would be problematic so I asked Steve P, who was next door on peg 7, if he had a weed cutter, which he did. I went out as far as my wellies would allow and discovered that they leaked which I hoped wasn’t an indicator of how the day was going to go! I actually hit a sizeable fish as I started clearing the weed and it must have just been sat there! I set up four rigs, a 4 x 16 Preston Chianti for 11.5 metres straight out, a 0.5 gram Drennan Roach for 10 metres, a 0.4 gram Drennan Pencil to fish off the end of the reeds to my right and another little Preston Chianti to fish shallow but I never actually used it so won’t mention it again. 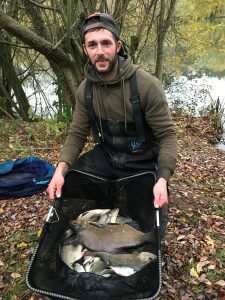 For bait I’d mixed up some Pro Natural Dark the night before plus I had a pint and a half of casters, half a pint of red maggots and some dead reds, a tin of corn and some Bait-Tech Super Seed Hemp. As Steve had a whistle, he got us underway at 10:00 and I cupped in a single ball of groundbait at 10 metres before putting in three balls plus a pot of casters, corn and hemp at 11.5 metres and lastly dead maggots, casters and hemp by the reeds at 10 metres towards peg 5. 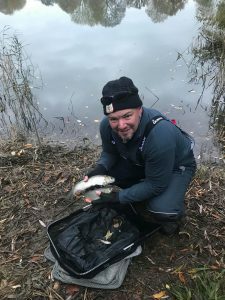 I started at 10 metres straight out with a single red maggot on the hook to see if I could get a bite, it took five minutes or so before I had an indication and I then missed two on the trot. It was third time lucky and a small roach got me off the mark, a few more followed and Steve was getting the odd fish too. 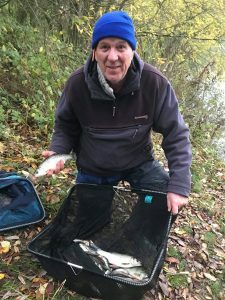 I tried double maggot and had a couple of slightly better roach and perch so slipped on a caster and started catching quite well, mainly small roach along with the odd better one of 4oz or so that I netted. 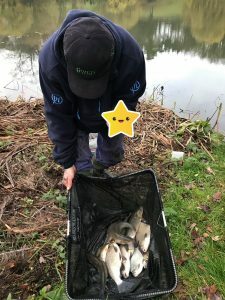 It also became apparent that I hadn’t done a very good job of removing the weed as half the fish were getting stuck in it as I shipped back and it would be fun and games if I hooked anything bigger. 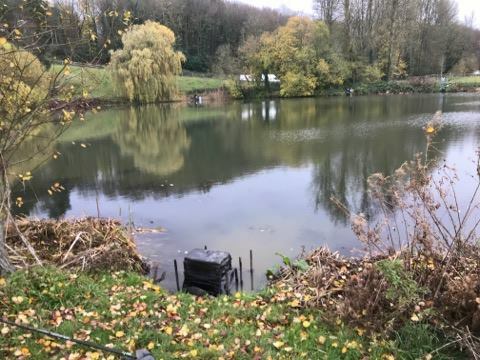 After an hour I had 21 fish for probably 1.5lb and was quite enjoying it, from what I could see I was doing well, Adie on peg 4 was fishing the feeder and I hadn’t seen him catch yet and with the pond being flat calm and clear and the water cold, I had my doubts whether the skimmers would feed today. During the second hour, my bites slowed up and I only added another 13 fish so I topped up the other two lines and would try them shortly. I had a couple of roach come off in the weed but from catching well, I was now struggling and it was the same for Steve. I’d also noticed Frank land a skimmer and then Adie had one as well but I wasn’t too worried at this early stage. 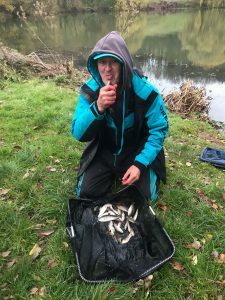 Nick Payne came for a walk and when he reached me, he said that Frank had landed a couple of better fish including a decent bream, Jake was struggling on peg 2 and Adie had some smaller skimmers and a decent one. While he was with me, I tried the 11.5 metre line for the first time with caster on the hook, after a few minutes, I had a lovely slow bite but instead of hitting solid resistance, a small roach flew out of the water and then came off as I shipped back, Nick had seen enough and left me to it. 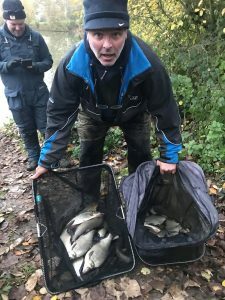 Frank landed a couple more decent fish in quick succession and then Dave on peg 19 next to him had a big bream so my theory that they wouldn’t feed had gone right out the window! I tried corn on the longer line but never had a bite so then went in by the reeds for the first time but no bites there either. Another bank walker turned up, a guy called Kev who said he was a reader of the blog and that he really enjoyed it, what a nice chap! He went on to say that Frank was catching well on single red maggot and just feeding casters and hemp. He stayed with me a bit longer but soon got bored of watching me catch nothing and went to see how the others were doing. I fed my two bonus fish lines again and went back on the 10 metre line with single red maggot, I had a couple of small roach but I was going nowhere fast. Frank was now bagging up with skimmers along with the odd chub and Dave had a couple more skimmers as well. Although I couldn’t see Jake, I did see his landing net go out a couple of times and I knew I needed bonus fish to stand any chance now. Adie had been feeding by a bush on his left and with around an hour and a half left, he’s gone in there and started catching some decent chublets. I’d fed by the reeds on my right since the start so went in there with corn, dead reds and double caster but I haven’t had a touch while Adie had around five chublets and lost a couple. In hindsight I probably should have stayed on the 11.5 metre line with maggot or caster on the hook as Digger on peg 14 had five skimmers in the last hour. 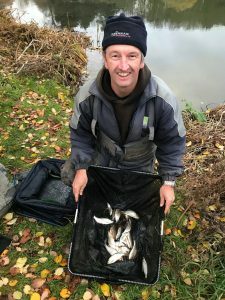 Steve blew for the all out and my total of 43 fish was rather disappointing after a promising start (that seems to be the story of the last few matches I’ve fished, started strongly before fizzling out!). 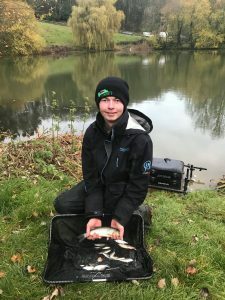 I packed up before going to start the weigh with Jake, he said he’d struggled early and then had a really good spell, he pulled his net out and had a lovely big bream, a 2lb plus perch and some skimmers for 16lb 14oz, a great weight on the day. He said he’d lost a few as well. 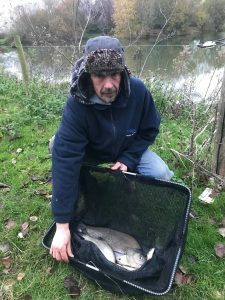 Adie was next and had 9lb 2oz of skimmers and chublets. My fish went a much more modest 3lb 6oz and I only weighed in for the sake of the side bet with Steve P who had 1lb 10oz. Adie had 9lb 2oz of skimmers and chublets and per usual was delighted at having his photo taken! 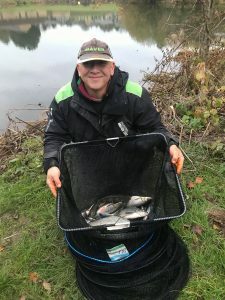 Karl on peg 8 had fished the waggler for most of the match and weighed 1lb 10oz as well, Fieldy was last in our section and had some skimmers and chublets for 8lb although he did lose a big fish late on. As I took my kit back to the car, I managed to catch up with the scales weighing the other section. It’s Ilminster’s Xmas Fayre on Sunday 9th December, weather permitting it will be on the river and everyone gets a prize! Food is included in the £15 ticket and the results and prize giving will be at Ilminster Bowling Club, if you would like to fish please let me or Max or Leighton at Ilminster Warehouse have your entry fee before Monday 3rd December so we can get an idea of numbers and sort the prizes. There will be an optional fiver super pool on the day as well. Lastly a friend of mine is selling a Maver Signature seat box, I think it’s the Venue model that fits inside a carry bag, it’s brand new and has never been out of the packaging, he would like £150 for it so if you’re interested, contact me and I can put you in touch.